Afterthought — or opportunity for real dialogue between residents and government officials? 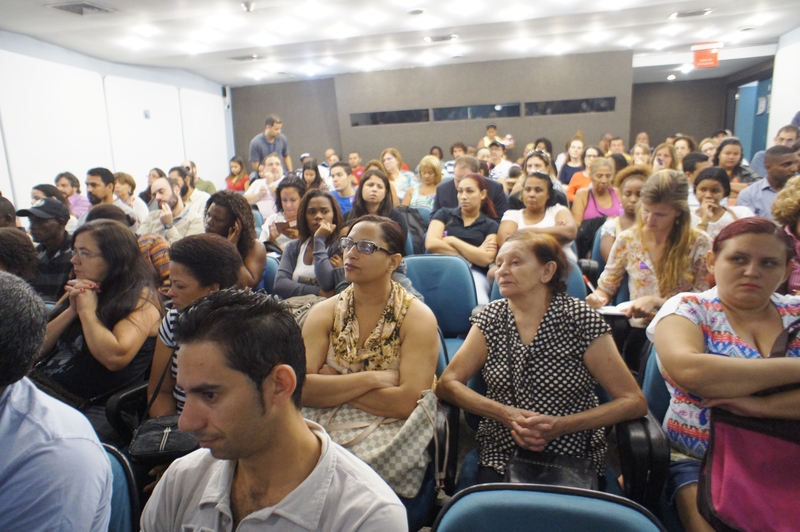 Yesterday, Rio’s City Hall held a public hearing, the first of six such meetings scheduled from now until August, to create a Programa de Habitação de Interesse Social (PHIS), or Social Housing Program for the port area. Officials present said they hoped the program drafting process would involve significant community participation. Residents in attendance greeted the proposal with optimism, raising some concerns while praising CDURP’s ability to deal with local issues. CDURP is the company set up by the city to manage Porto Maravilha (Marvelous Port) revitalization. 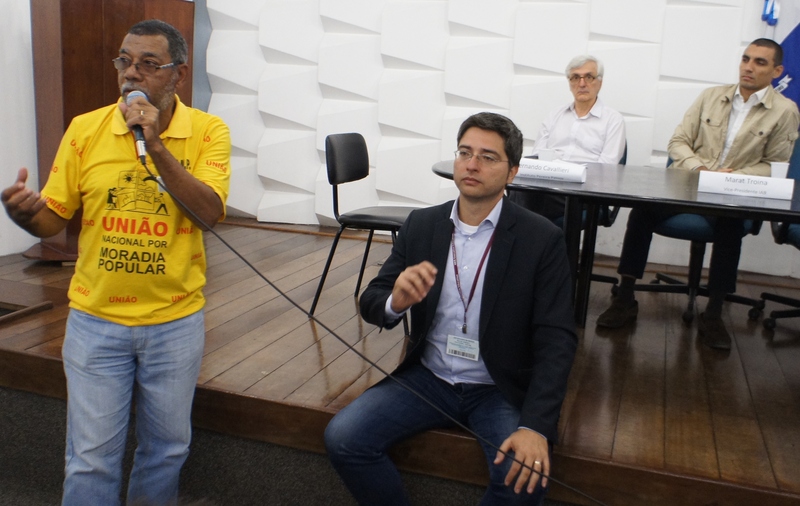 In Rio de Janeiro, not unlike other cities in the world, public hearings tend to be pro forma, held only to meet legal requirements. Invitations for true community participation are rare. Yesterday’s came somewhat late, six years after the creation of the Operação Urbana Consorciada da Área de Especial Interesse Urbanístico da Região Portuária do Rio de Janeiro, or the Consortiated Urban Operation for the Area of Special Urban Interest of the Rio de Janeiro Port Area. Applause rang out in the auditorium each time the word territorialidade (territoriality) was pronounced, with the idea of keeping the current 30,000 residents where they now live (and even, per one request, bringing back those who have left the area; 40% of all households are renters, with market pressure already coming to bear on them). Only one person, former alderwoman Sonia Rabello, member of the Social Housing Municipal Council, president of the Federation of Rio de Janeiro Neighborhood Associations, criticized the city’s plans. The doubts expressed are those of any metropolis in transformation: how to revitalize degraded areas, attracting investment while also maintaining certain urban characteristics and protecting citizens as much as possible? Rio de Janeiro has very little experience in fomenting this kind of equilibrium. Carlos Coutinho, the new Housing Secretary, has no urban experience on his CV nor any in the area of housing, either. According to a post in Sonia Rabello’s blog, the city’s move to dialogue with residents comes in response to pressure from the Ministry of Cities, said to have set this as a requirement for additional Porto Maravilha funding. At the start of yesterday’s hearing, Eduarda La Rocque, president of Rio’s municipal urban development and data analysis agency, Instituto Pereira Passos, which is incubating the new Pacto do Rio (Rio Pact) offered an incentive for CDURP to come up with a low-income housing program with real local participation: a quality seal, to be awarded by the Pact. A quality seal would be wonderful. Better still for all would be a revitalized urban area, vibrant day and night, a place of rich encounters among people of varying professions, experience and abilities. We’ll soon know the outcome of the process that was begun yesterday. As of tomorrow, June 12, the information presented during the public hearing will be available here and here. If you have a proposal, question or a contribution to make to the Plan, you can write to habitação@cdurp.com.br. 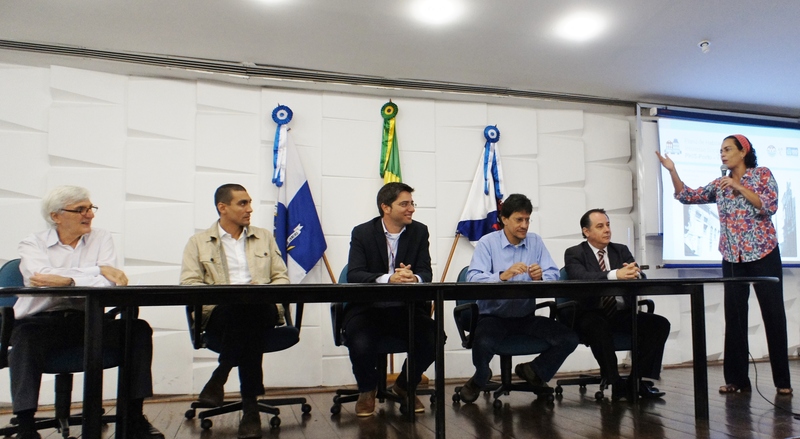 The upcoming meetings are to be held at CDURP headquarters on Rua Sacadura Cabral, June 18 and 25, and July 2, 9, and 30. You can read an excellent analysis of the same subject here, published in Portuguese by the Observatório das Metrópoles. This entry was posted in Brasil, Porto Rio de Janeiro, Transformation of Rio de Janeiro / Transformação do Rio de Janeiro and tagged Alberto Gomes Silva CDURP, Carlos Coutinho, Eduarda la Rocque, low income housing Rio de Janeiro, Ministério das Cidades Porto Maravilha, Porto Maravilha, Programa de Habitação de Interesse Social, Rio de Janeiro City Hall, Rio de Janeiro housing, Rio de Janeiro Port, Rio de Janeiro port revitalization, Secretaria de Habitação Rio de Janeiro, social housing Rio de Janeiro, Sonia Rabello. Bookmark the permalink.